So is the class complete or are there some last minute additions coming? We have a committment from an ECC transfer player, Ahmad Holloway. 6'4" 300 lb DT from Clarence HS. 6'2 corner.. height and speed at corner is always a plus. They never mentioned OL - Tyler Doty or LS - Evan Davis in the initial class so maybe they will be February signees...? do we know many scholarships this years cycle? Awesome commit! We inpressed him ober some high major offers. Another 2019 HS verbal tonight per Scott Wilson. Jijel McGriff, 6'3" 260 DL out of Florida. His HS won the state title in the largest state classification. But we were his only D1 offer. Leipold has a history of “Greyshirting” players. If you recall Jelani Foster was actually going to be apart of the 2018 class. I would guess that both Doty and and Evan Davis fall under this category and would join the team in Jan of 2020. Same could be said for Logic Hudgens who hasn’t signed his LOI as well. I would guess that Malik Brooks wasn’t taken because of Grades. I mean he had two offers despite his high talent level and flipped after 3 days to Monmouth. 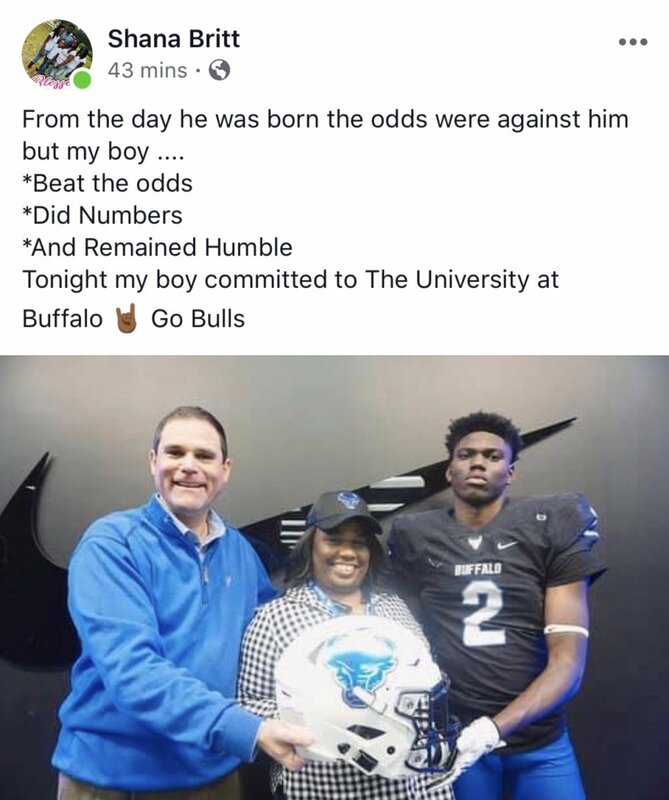 Makes me think Buffalo took his commitment then got his transcripts and said wish he’s not gonna qualify. Then he surprisingly commits to Monmouth in the early period. This is just speculation in my part. UB also got Anthony “Caron” Robinson from Aquinas in Rochester. Not sure if he is a Greyshirt or a PWO, but he is definitely a Division 1 talent and could make an impact at Buffalo down the line. I encourage people to take a look if you have never seen him before.